Good day to all you lovers of whimsy and what not. We have another HORROR – Scope for you. The charts have been scoured by the hour to find a best in unfortunate circumstances for you unfortunate creatures. Which is something you should be used to by now if you have been following Your HORROR – Scope for any length of time. This week’s framework of fortunes includes: snowshoes, toe jam, and the ever popular, politician. Aries… Saturn is square and in opposition to Aries. That’s not a good sign for an Aries, or a polyglot. In the future, you will be embarrassed to say the word, “gaggle” in public…especially when geese are about. Taurus… Uranus is in quasi-modal position now. That’s always bad for a Taurus, or any scab picker. In the future, you’ll find yourself studying mosaic tiles in an attempt to learn more about Moses. You will be ridiculed and avoided, but you’ll have a very nice floor in your home. Gemini… Mars is semi-distal now and a square with Gemini. That’s always a bad sign for a Gemini, or a dead cat juggler. In the future, you will become so weak you won’t even be able to raise your blood pressure. You will end up in a hospital bed next to a raving heathen wearing snowshoes. Cancer… The Moon is in semi-distal mode now, and on the cusp of Cancer. That’s never a good sign for a Cancer, or any crop duster pilot. In the far future, you will spend many months and lots of money researching and writing a book called, “How To Wallow With Your Wallet”. Only a few pig farmers will buy a copy. You will give up eating pork afterwards. 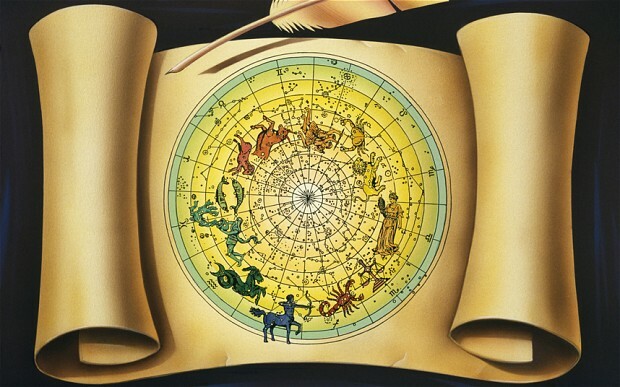 Leo… The Sun is in opposition and equidistant to Leo at this time. That is not good for a Leo, or any fish farmer. One day in the future, you will find yourself involved with onions or grunions. In either case, it will be an awfully smelly situation, which will linger for a long time. Virgo… Mercury is in digression now and hyper extended. That’s always a bad sign for a Virgo, or a tree root sucker. In the future, you will open a business selling Jewelry for Jowls. Your only customer will be Dennis Miller. You will lose everything. Well, at least you will have tried. Libra… Jupiter is misaligned with Mars at this point and can’t get back into alignment. That’s not good for a Libra, or a toe jam collector. In the far future, you will spend many months and lots of money researching and writing a book called, “How To Pet A Pickerel”. Only a few fishermen and Weird Al will buy a copy. You will consider your efforts in vain. Scorpio… Pluto is in diametric opposition to Scorpio now. That’s very bad for a Scorpio, or a duck billed platypus. In the future, you will discover someone you know from Kokomo who plays the banjo for hobos. He will be a con man who will steal everything from you. At least you’ll have your health… for a while. Sagittarius… The Earth is in sub-conjunctive mode at this time. That’s not good for a Sagittarius, or any wino in Seattle. In the future you’ll be embarrassed to say the word, pneumatic in public. As a result, you will shun association with others. Capricorn… Venus is on the cusp of Capricorn but in opposition to Jupiter. That’s always a bad sign for a Capricorn, or any suppository salesman. In the future, you will shock yourself with a Tesla coil to energize yourself. The electrons in your body will revolt causing you to go into convulsions, or a nearby convenience store. It isn’t clear. Aquarius… Uranus is in trilateral opposition to Aquarius now. That’s not a good sign for an Aquarius, or the target of a circus, blindfolded knife thrower. In the future, you will urge someone to name their child after the Hoover Dam, but they won’t be comfortable with the word, Dam. As a result, they will shun you.